To commemorate their five year anniversary as one of Detroit's most unique and enigmatic electronic labels, Ersatz Audio is making available a CD compilation "The Forgotten Sounds of Tomorrow." featuring a comprehensive selection of works from previous releases. This spectacular collection of music culminates a true commitment to the burgeoning electronic music genre. However, what distinguishes the Ersatz Audio label from all others, is its stripped down sound. With a sublimated sense of humor, they continue to explore the often overlooked electronic synth pop of the 80's. Their austere interpretations with purposeful irony demand careful listening. "The Forgotten Sounds of Tomorrow." is also an homage to the visual artist who have helped shape EA's distinctive visual style. A look which has been featured in the internationally recognized guide to cutting edge graphic design DiscStyle (published by Edition Olms AG). Adam Lee Miller along with Rita Sayegh (of Constructure Design, Detroit) established the initial branding which the Ersatz Audio label has become known for. The CD booklet also features the visual art of Nicola Kuperus, Riva Sayegh, Philip Burke, Adam Lee Miller and Matthew Gollnick. 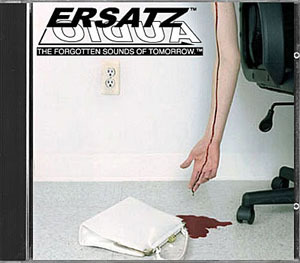 On February 19, 2000, Ersatz Audio hosted a one night exhibition-event "The Forgotten Sights & Sounds of Tomorrow", an exhibition of Art, Design, Music and Commerce, at the detroit contemporary. With live performance by ADULT. & PERSPECTS. This event also showcased artwork from those included in the CD booklet. Check out pictures from this event by clicking on the camera below. BEHIND THE SCENES shooting the cover of EZCD-11.